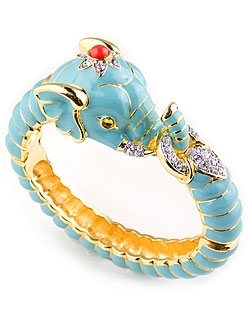 Turquoise elephant bracelet by Kenneth Jay Lane. This striking designer bracelet features an elephant head with a coral bead detail and swarovski crystals on its trunk and teeth. Bracelet is realised in a pale blue / turquoise enamel and gold stripes and measures 6cm (2.5") in diameter. A signature piece by Kenneth Jay lane easy to wear all day. Also makes a wonderful gift for a loved one.